There are certain foods that are better when not made at home, like french fries. To achieve golden-brown perfection, you have to fry them twice: first at a low temperature, to poach them; then at a high heat, to crisp them up. Very tasty, very much a pain in the neck. A few years back, I read about how French chef Joel Robuchon supposedly does it at his house: He puts sliced potatoes in a pot of cold oil, turns on the heat, and lets them go. It sounds too simple to work. But as the temperature rises, the potatoes cook from the outer layer in until the fries are wonderfully crunchy outside and creamy in the center. 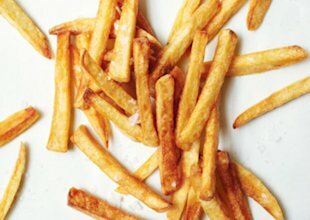 You’ll never make fries any other way-even if you’ve never made them before. Peel 2 lb. 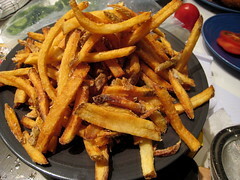 large russet potatoes; cut into long french-fry sticks, about 3/8×3/8 inches thick. Rinse; shake off water. Transfer potatoes to a large deep heavy pot, spreading potatoes so they’re no more than 2 layers deep. 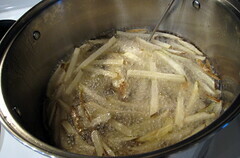 Pour in safflower or vegetable oil to cover potatoes by 1″. Place pot over medium heat. 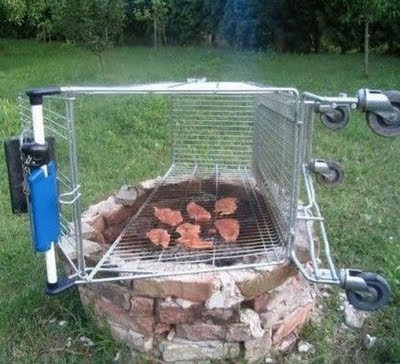 Cook for 15 minutes (oil will begin bubbling gently). Continue cooking, occasionally loosening potatoes from the bottom of the pot with a heatproof spatula, until potatoes are very tender, 25-30 minutes more. Increase heat to medium-high and cook until golden and crisp, about 15 minutes longer (oil will bubble more vigorously).